“The people of the United State can be proud he’s representing America and its interests abroad…” Clinton claims. 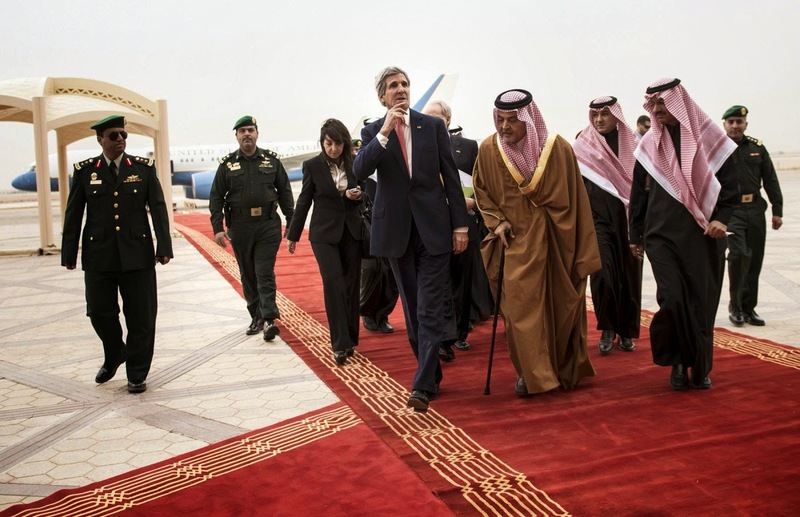 Ironically, the picture featured alongside Clinton’s comments was of Kerry in Riyadh visiting the unelected Saudi regime who currently preside over a kingdom where state resources are squandered funding sectarian extremists abroad in places like Libya and Syria, and domestically where women can neither vote nor drive, and enemies of the state – which include heretics, homosexuals, and political opponents (charged for treason, sedition, or terrorism) – are beheaded publicly by swordsmen. Surely Kerry is not representing America or its interests – but rather corporations and financiers residing within America and their interests. Had Albright not mentioned Putin by name, one may have thought she was reflecting on her own career – one which included the sanctioning of Iraq at the cost of starving to death over half a million children, before an illegal war based on “toxic fictions” that led to the death of another 1 million civilians, and left the nation of Iraq to this day in perpetual violent conflict. Albright’s parting shot of, “history is filled with aggressors who triumphed for a moment. Then failed,” could just as easily be directed at US President George Bush who proclaimed aboard the USS Abraham Lincoln in 2003, “mission accomplished,” before America was dragged through a nearly decade long occupation of Iraq that ended in its withdrawal and Iranian influence filling the remaining void.